Excellent fishing conditions are upon us this week. Temperatures hovering around the freezing mark, and partly cloudy days should put us back in a rhythm. The last round of weather was very unsettled and it was apparent in the fishing. The action has not been fast or furious, but the fish that are eating well seem to be in the larger size range. A trickle of pre-spawning Rainbows are beginning to make their way into the Stanton Crossing reach of the Big Wood. There are even a few early redds in some of the gravel channels. Give this area another week or two and it should be very good fishing. The biggest challenge now is the parking. Currently, Stanton Crossing camping area is it for the whole area. If you go, be willing to walk! We only have a week left to fish on Silver Creek before it closes for the spring spawning season. The last two weeks of fishing on the Creek are often the best Streamer fishing days of the year. Concentrate on the Point of Rocks and Picabo Bridge areas as the fish will move into this stretch looking for slightly warmer water temperatures. Anglers that are eager to get out and fish their favorite freestone rivers like the Big Wood better get out there now. There are about 6 weeks left of this style of fishing at these flows. When the rivers reopen at the end of May we can expect them to be high and unfishable until the first week or two of July. The run-off this year should be a spectacle as we approach nearly 200% snow pack. With this said, June is going to be a Silver Creek month, so if you’ve been shy about fishing this spring creek, it’s time to come out of your shell! Silver Creek can be a forgiving fishery the first few weeks of the season. This is a great time for those looking to learn the Creek. Anglers can get a head start by studying the June hatches and gearing up for a spring creek fishery. This means fishing soft rods and long leaders. Now is the time to start practicing! It would also be a good time to get a lay of the land. Scout the Creek from top to bottom while it is closed and quiet. When opening day comes, you’ll know exactly where you want to be! Adaptability and having a lot of arrows in your proverbial quiver seems to be the key to success on most of our local rivers these days. Rapidly changing conditions both in the atmosphere and the water itself have made for some challenging days. It seems as though the anglers that have the willingness to switch techniques from run to run, river to river are doing just fine. Anglers that are stuck with one bag of tricks are not doing well. The Big Wood is fishing well if you are switching to dry flies when the fish are up, nymphs when the water type is perfect and streamers the rest of the time! Anglers fishing closer to Ketchum are doing better than anglers fishing closer to Bellevue. Skwala Stoneflies have suddenly made an appearance on the Wood, signaling an early start to this year’s hatches perhaps? It is also a signal of change in the Wood as this is not an insect we consider most years in March. Again, adaptability, letting go of what we think we know and believe to be true on our area rivers is important. 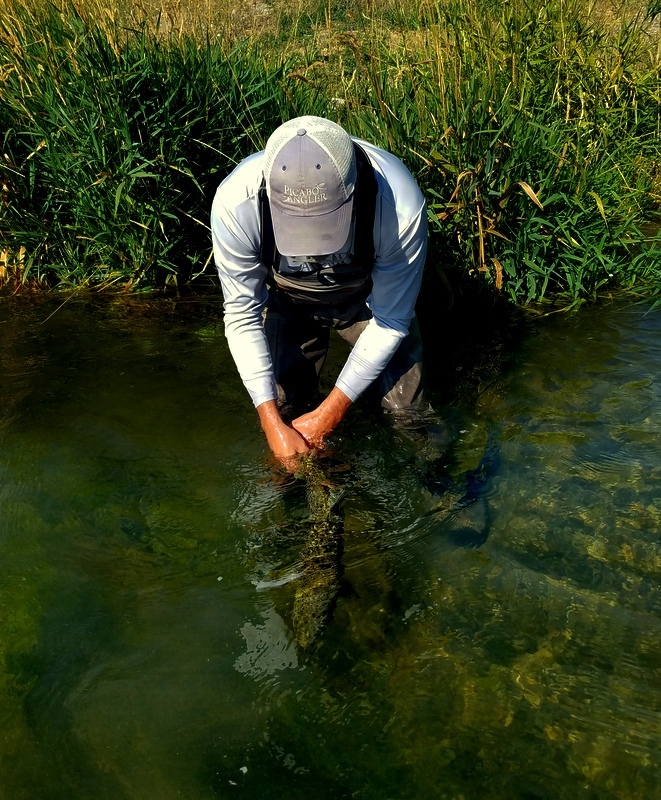 There is no doubt that we are seeing a fundamental shift in how we fish in the Sun Valley area. Brown Drakes keep coming to Silver Creek earlier and earlier each season, Callibaetis is becoming a season long hatch instead of a heat of summer occurrence and more and more we are seeing odd events on the river and even bugs we’ve never seen before on our area waters. No alarms here! It is all good. In fact we love the change and we love that it keeps anglers on our toes and keeps fishing interesting, especially for anglers that have been plying the Valley waters for several decades. If you head out this week to any of our area waters, load for bear! This spring should continue to bring us events we were not expecting. Some good, some bad, but all interesting. Enjoy the warmish daytime temperatures and get out there! 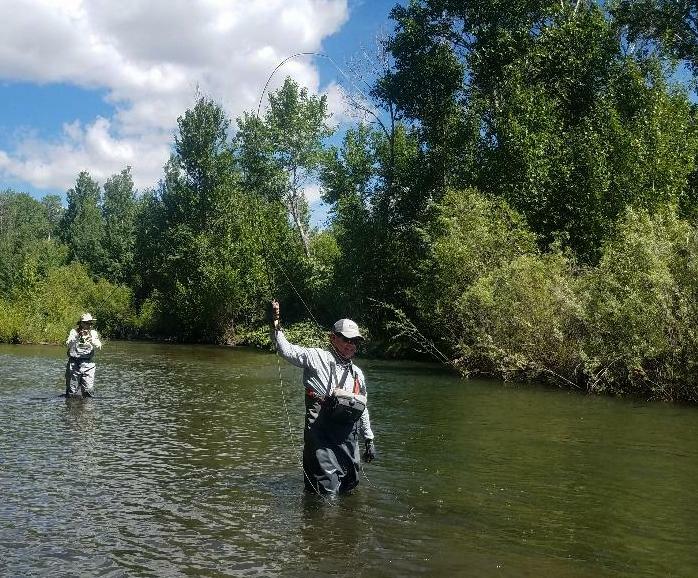 Your best bets this week are the Lost River, the Salmon River for Steelhead, the Big Wood below Magic Reservoir, and the Big Wood north of Hailey continuing north of Ketchum a few miles. Don’t get discouraged by a tough hour or bad run on the river, just stay on the move, stay flexible with your technique and enjoy one of the best times of the year to be a local angler!